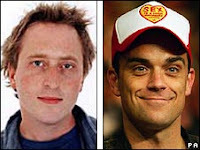 Robbie Williams Jon Ronson got together in a 30 minute documentary made by BBC Radio 4 on the subject of Extra Terrestrials and UFOs. In this programme Robbie and Jon attended a UFO conference in Laughlin, Nevada for 3 days. During the course of events they also meet a British lady Ann Andrews and her youngest son, Jason who is an Indigo Child, taken by Extra Terrestrials while he was in the womb and sent back to save the planet. The show was broadcasted on Tuesday, 6th May, at 18:30 (BST) on BBC Radio 4 . You can listen to some clips from the documentary here .